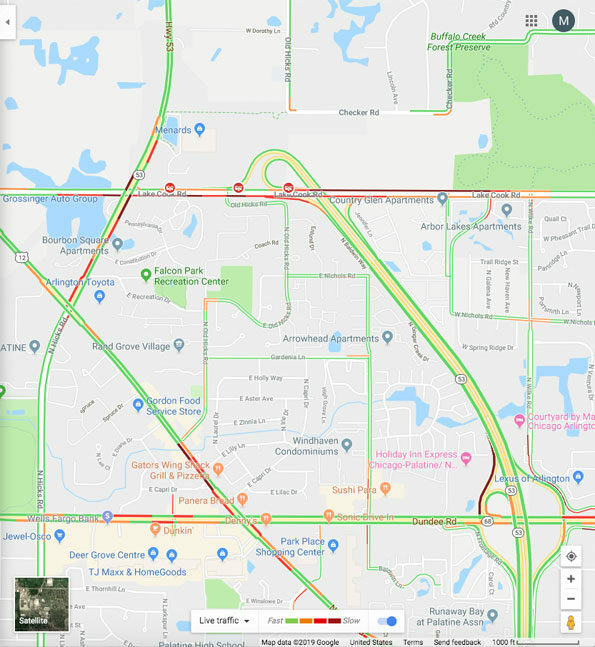 Long Grove police and firefighter/paramedics responded about 11:03 AM Saturday April 13, 2019 to a report of a crash with injuries Westbound Lake Cook Rd and Route 53 near the Route 53 spur, Long Grove, Il. Firefighter/paramedics while responding reported heavy traffic congestion in both directions. Long Grove’s Battalion Chief 55 on arrival 11:11 a.m. reported that the crash is an extrication crash, and requested an extra extrication crew, and and additional two ambulances. Four total patients were injured. One patient was entrapped, and required a prolonged extrication operation. Battalion Chief 55 reported extrication complete at 11:38 a.m.
Three patients were transported to Northwest Community Hospital — one by Lake Zurich Fire Rescue Ambulance 324’s crew and two patients by Palatine Fire Department’s Ambulance 82’s crew. Long Grove FPD Ambulance 55’s crew transported one patient to Level I Trauma Center Advocate Lutheran General Hospital about 11:45 a.m. The conditions of the patients were not immediately available. A second crash on westbound Lake Cook Road, closer to Menard’s at about 12:46 p.m., also injured at least four people. Long Ambulance 55R, Arlington Heights Ambulance 4, and Buffalo Grove Ambulance 25 were dispatched to the scene. Traffic conditions on Lake Cook Road and Route 53 after an extrication crash Saturday April 13, 2019.